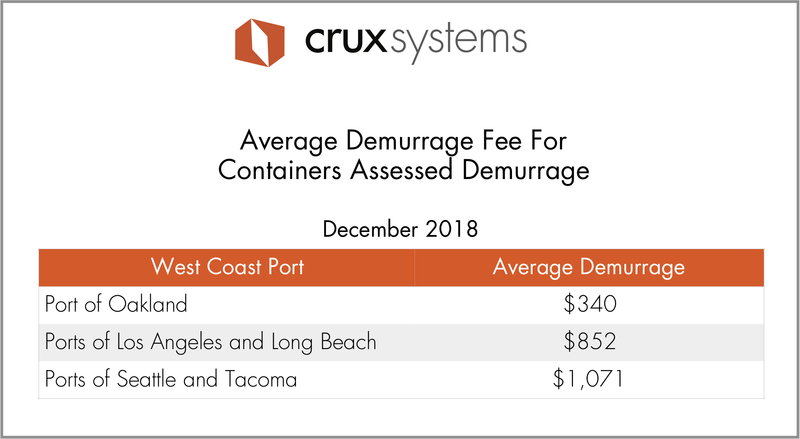 With an increase in container volume at West Coast ports at the end of the year, we saw a corresponding increase in dwell times and demurrage fees for the containers we're tracking on our platform. In October, there was a 30% increase in the number of containers we were tracking through the ports of Los Angeles and Long Beach. Average dwell times went from 4 days to 6 days, but what was even more striking was that the number of containers with dwell times of longer than 5 days increased by 47% from October through December. This resulted in a huge increase in demurrage fees. The total amount of demurrage for containers we were tracking at the ports of Los Angeles and Long Beach increased fourfold in October. And then from October to December, the amount doubled. Other West Coast ports saw similar trends over the same time period. In Oakland, there was a 21% increase in cargo we were tracking through the port, and another 27% increase in December. Similarly, the number of containers with dwell times of longer than 5 days increased by 53%, and the average dwell times went from just under 4 days to just under 6 days from October to December. Although the dwell times increased, the amount paid in demurrage fees at the Port of Oakland actually decreased slightly in October and November. December was a different story, as during that month demurrage fees shot up dramatically, increasing tenfold over October. The ports of Seattle and Tacoma had a smaller increase in container volume we were tracking, but a 61% increase in the number of containers with dwell times of longer than 5 days. Average dwell times increased from a little under 4 days to just under 5 days. Demurrage here also increased dramatically. In October, the amount of demurrage paid for containers we were tracking at the ports of Seattle and Tacoma increased tenfold, and then increased another 14% from October to December. Clearly, though, the ports of Los Angeles and Long Beach were impacted the most, with the biggest volumes and delays. In December, nearly 10% of the containers we were tracking through those ports were assessed demurrage fees. That's compared to 2% of the containers we were tracking through Oakland that had demurrage fees, and just under 4% of containers we were tracking through the ports of Seattle and Tacoma. As we've been tracking vessels headed to West Coast ports, we've seen some vessels that have skipped their port calls at Los Angeles and Long Beach, made other stops on their route and circled back to Los Angeles and Long Beach to offload their cargo, contributing to the delays and change in ETAs for the vessels that many have seen on their dashboards. In addition to the increase container volume (largely due to a surge of cargo shipped in advance of upcoming tariffs), a lack of chassis, a lack of drivers, and a lack of warehouse space have all compounded the problems. For a look at some of the other factors contributing to the congestion at the ports, see this blog post about the increasing dwell times and demurrage fees.